'Our rules apply to everybody,' Roger Goodell said. 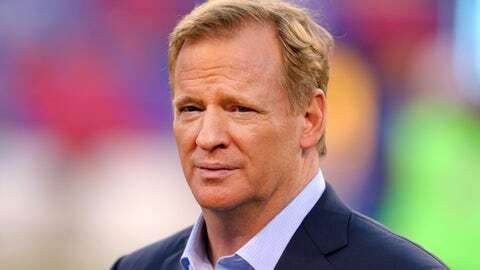 NFL Commissioner Roger Goodell has no regrets about the league pursing Deflategate, despite an appeals court overruling the NFL’s four-game suspension of New England Patriots quarterback Tom Brady. "I have a lot of respect and admiration for Tom," Goodell said at the owners meetings in New York on Wednesday. "I know him personally. As I say, I admire him tremendously. He is a future Hall of Fame player." But Goodell added that despite Brady’s stature, the rules can’t be circumvented. "Our rules apply to everybody. They apply to every single player. And every single player expects those rules to apply to everybody. Every coach does, every fan does, every partner, every team does. "Our rules and the integrity of our game aren’t because someone’s popular or somebody’s a Super Bowl champ or not. They’re to be applied evenly. Our teams expect that, and that’s our job. That’s our responsibility. That’s my job. And so, no I don’t regret that. And we will continue to uphold the integrity of the game and we’ll do that as vehemently as we can." Brady has insisted he played no role in a conspiracy to deflate footballs below the allowable limit at last season’s AFC championship game, a 45-7 rout of the Indianapolis Colts. "Because there was no notice of a four-game suspension in the circumstances presented here, Commissioner Goodell may be said to have ‘dispensed his own brand of industrial justice,’" U.S. District Judge Richard M. Berman wrote when he ruled in favor of Brady on Sept. 4. The league appealed to the 2nd U.S. Circuit Court of Appeals in Manhattan, but the court said February would be the earliest it would hear the NFL’s arguments.